【SOOTHING HEAT THERAPY】The optional heat function adds gentle warmth that helps to relax muscles pain, soothe fatigue. and simultaneously improve blood circulation. Automatic shut-off after 15 minutes for safe use. 【U-SHAPE ERGONOMIC DESIGN】 such a design is to fit contour of the body so that it is capable of performing effective massage to neck, shoulder, back, lower back, legs, calves and foot. INTENSITY CONTROL SLEEVE: With a detachable & washable sleeve to allow you choose a softer or more intense massage. 【ARMREST STRAPS DESIGN】 The neck and shoulder massager with armrest straps to keep you hands free for on-going projects, while enjoy relaxation simultaneously. 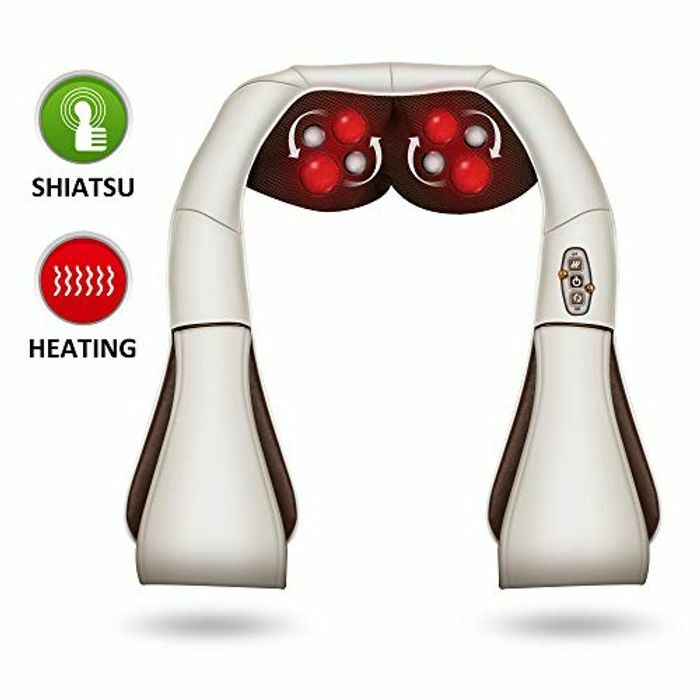 【PORTABLE MASSAGER】This neck and back massager includes a wall home adapter and a car adapter, you can enjoy an electric massage at home, office or car. MONEY BACK GUARANTEE- If, for any reason, you are not 100% satisfied with SNAILAX neck massager , return them within 30 days and get your money back. The reviews for this is very good. I get a lot of back and shoulder pain. This would help me a lot. Going to get one, thank you kristinakr82846 for sharing this very good deal. Ah, great find! I've been on the look out for one of these as I've seen them recommended lots, thanks for sharing such a bargain one! This is a great make so I'd have high expectations. Fantastic price too. Might just have to get one!